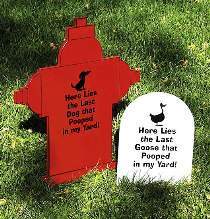 These animal "headstones" are sure to bring a smile. Perfect for those of you plagued with Canada Geese "stop-overs" or that pesky stray dog that seems to like your yard the best. Plan includes FULL SIZE patterns for both stones. Measure 12" and 21"H. Order one decal and one yard ornament mounting kit for each project you make.